Rideshare and transportation network companies (TNCs) like Uber and Lyft have taken on a significant role at airports in the last few years. Their presence has proven to be a double-edged sword. Yes, they provide convenience and a less stressful transportation alternative to the traveling public. However, they have simultaneously caused headaches for airport operators and disgruntled taxi companies losing business to folks who are seemingly playing by different rules. Private companies like Uber are constantly investing to drive innovation and create value-add products and services for their customers. This inevitably throws a wrench into the works for the airport when that company joins their ecosystem. The airport has to react to these changing circumstances and can’t necessarily do so with ease. For Uber and the airport, Plot’s technology partnership is a practical remedy. Our solutions deploy quickly and can address many of the operational pains that polarize the airport and rideshare companies. As an added benefit, rideshare companies are improving the overall passenger journey by integrating the airport data we collect onto their platform. Airports have had difficulty tracking companies like Uber. From ride count, to dwell time, and rideshare traffic volume, these are all areas that the airport has needed to address for accounting purposes and operational transparency. With Plot’s object recognition and license plate recognition (LPR) technology, we’ve created a data capture and reporting platform that sheds light into each of these areas of mutual interest. The struggles caused by a lack of transparency have even led some airports to create designated TNC areas, both on and off site, to solve their problems. While the intention is to have more operational control, this solution has also created its own set of challenges including but not limited to the rideshare companies following guidelines and passengers arriving to the appropriate area with ease. To be able to track this activity from both the operator and the passenger perspective requires a flexible sensor deployment and the correct sensor selection. Airports that have Plot’s Wifi and bluetooth sensors deployed throughout their facilities are equipped with a robust communication platform. Depending on the location of a passenger in the airport and the current status of their Uber ride, alerts, notifications and promotional offers can be pushed to the app user with pinpoint accuracy. This sort of engagement has operational benefits. Notifications and directions about how to arrive at the appropriate pick-up area can be sent to lost passengers at curbside or in the airport parking garage. For passengers stuck waiting for luggage at baggage claim or in line at customs, this geo-locating functionality also allows us to better pair passengers and Uber drivers to reduce congestion curbside and create a smoother passenger journey. 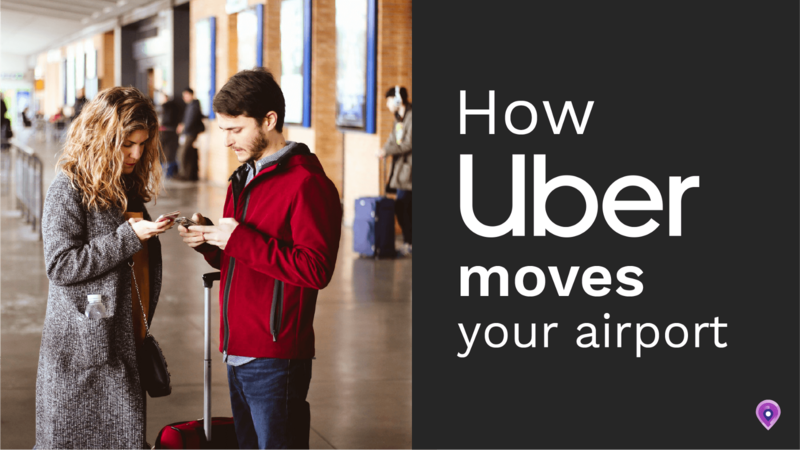 Rideshare companies like Uber use our simple API integration to inform travelers about live and forecasted airport conditions before they ever leave their home or hotel. If, for example, airline check-in areas and security checkpoints are getting crowded, our AI can translate real-time and historical data into important day-of-travel information that can be relayed to the traveler. Taking the traffic conditions into consideration, the Uber application can notify a given passenger that they should consider leaving to the airport 30 minutes earlier due to high passenger traffic volumes. The Uber application can update that passenger on the live wait time conditions as they arrive to the airport as well as what sort of wait time to expect when they eventually approach the area. Uber and Lyft’s presence at airports is likely only going to increase in the coming years. This combined with the fact that new companies will be created with a unique service offering or business model means airports can look forward to more operational obstacles to hurdle in the future. In order to appropriately deal with what’s cast their way, airports need to be able to respond effectively and efficiently to problems that arise, or be left at the mercy of advances in technology and innovation. After all, it might not be too long until you have electric Uber VTOL’s landing at your airport :). Evan Biller is the Commercial Vice President at Plot. His responsibilities include growing Plot’s portfolio of airport partners on a global scale, while also developing commercial relationships with key players connected to the aviation industry. His goal is to get vital airport data into the hands of people who are passionate about enhancing the passenger experience and improving operations.